The LED Signage Series requires no warm up time, is not effected by cold temperatures, has no UV radiation, has no mercury, and has a 50,000 hour life expectancy. Maintenance friendly and saves on associated costs. Easy to install, low defect rate, low service calls, quicker installation time. No UV, No Infrared, No Glass, No filaments to break, No lead or mercury. Highly resistant to shock, Solid-State Nature. Low Voltage, Low heat output compared to fluorescent lamps – will not deteriorate sign faces and color due to heat. Significant reduction in energy consumption while simultaneously improving performance. Reduces Energy Consumption and vastly reduces energy costs. Long Life rated – up to 30,000 plus hours. Pole Signs, Vending Machines, Wall Sign Cabinets, Display Cases, Monument Signs, Refrigeration Coolers, Menu Boards, Cove Lighting, Back-Lit Awnings and Anywhere High-Output Fluorescent Lamps are used. No need to alter or modify new sign projects or existing signs. To retrofit signs, it’s as easy as re-lamping and replacing the ballasts with a LED power supply. Use existing sockets and create a positive and negative side leading to the LED power supply. 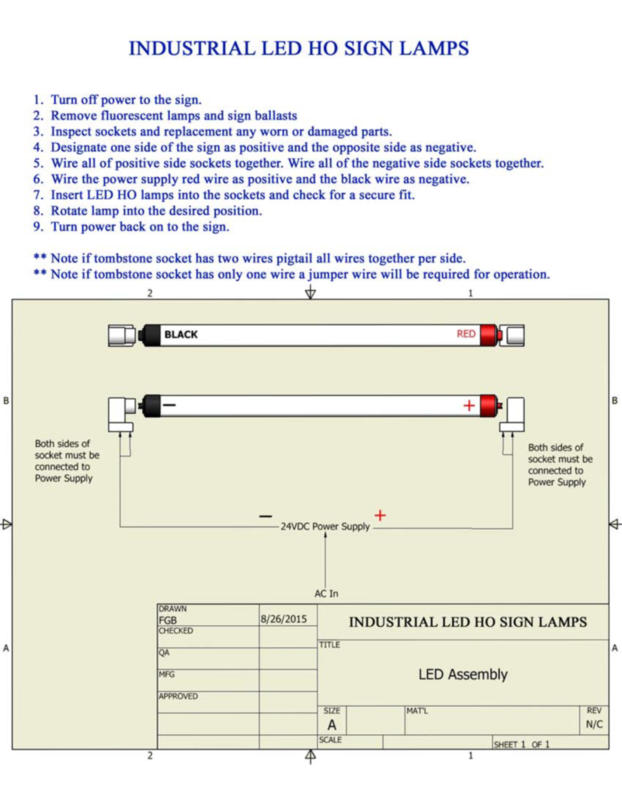 For new signs being manufactured just use the traditional manufacturing method instead of using HO fluorescent lamps use the new LED HO sign Lighting System. Lengths available (inches): 18, 24, 30, 42, 48, 60, 72, 84, 96, 108, 117, 120, or contact us for custom sizes. 1-sided and 2-sided LED lamps with rotating ends. Assembled in the USA!